Children’s Liturgy of the Word (CLOW) adapts the Sunday liturgy to make it relevant and understandable to the lives and experiences of our children. CLOW is offered during the 9:00 A.M. and 11:00 A.M. Mass, except during sacraments of Baptism and First Communion or certain feast days. CLOW is typically on hiatus from Father’s Day weekend until the weekend after Labor Day. Children do not need to sign up ahead of time to attend CLOW. Just prior to our first reading, the children are called to the front of the church and greeted by our celebrant. They and their adult leaders are then dismissed with song and blessing to discover what the Gospel message has to say to them. 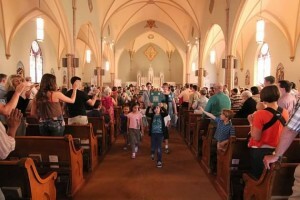 The children never “leave” Mass. They are not dismissed from Mass, but dismissed to participate at their level. The adapted readings are proclaimed and the children participate in all the liturgical elements, such as the Gloria and the Gospel Acclamation, just as their parents are doing in the main body of the church. It is still Mass. The 3-5 year old children gather together and use coloring sheets as a way to emphasize the message of the day’s Gospel while the 5-12 year olds gather together to share what they hear in the Gospel and to think about how they will live the message throughout their week. Following the Liturgy of the Word, the children return to their seats in the church to celebrate the Liturgy of the Eucharist with their families. The ministry of Children’s Liturgy speaks of our commitment to reaching out and providing an accessible understanding of the weekly readings to the youngest members of our community. How Will You RESPOND to His Call to Share the Scripture? We invite you to be a part of the team. Note, that we are not looking for teachers. The weekly CLOW leaders do not teach. They share the Sunday scripture with the children and invite reflection and conversation. I am responding to God's Call To Share the Gospel!